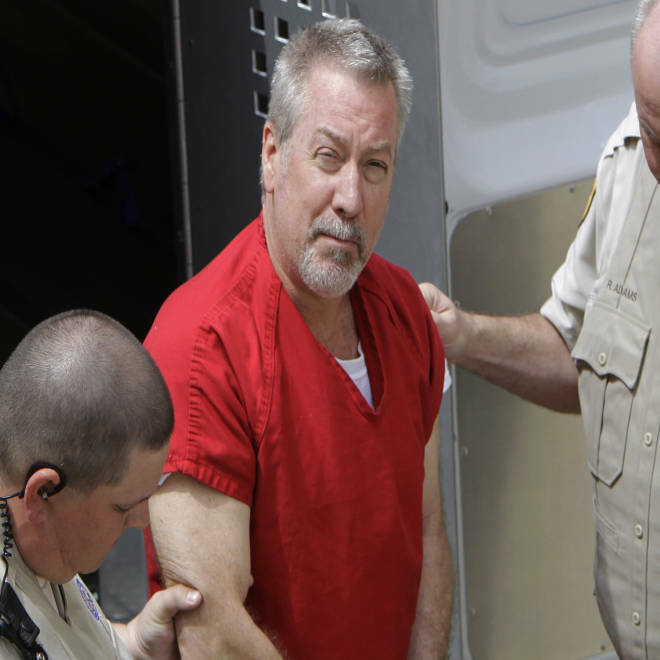 This month, a jury found Drew Peterson, a former Illinois police sergeant turned flamboyant criminal, guilty of the 2004 murder of his ex-wife Kathy Savio. Now, hundreds had gathered to celebrate. Dateline NBC's Hoda Kotb reports. As a former police officer, Drew Peterson may have a tougher time behind bars than other inmates, according to prison experts. But as the one-time “Police Officer of the Year” awaits sentencing for the murder of his third wife, Kathleen Savio, one ex-cop who spent time behind bars says Peterson's brash personality could be at least as big a liability. Peterson, 58, was found guilty of first degree murder of Savio last week, and faces up to 60 years in prison when he is sentenced on Nov. 26. While he is far from the first police officer to be staring down decades behind bars, he is among the most high profile, with his story catalogued in countless TV shows and tabloid magazines. “[Inmates] know everything. They know your background, what you’ve done, where you work. There are televisions, there are newspapers, and they probably cheered when he was found guilty," said Pederson, who served 15 months in the federal prison in Oxford, Wis., on a 1992 conviction for theft of public records. Much of Peterson’s experience will be driven by whether prison officials decide to incarcerate him with the general inmate population or alone in segregation. But making that decision, a board will weigh the pros and cons of both options for Peterson. However, because Peterson has not yet been evaluated by the department, IDOD spokesperson Kayce Ataiyero told NBC News that there is no way of determining at this time whether he will be housed with or segregated from the general prison population. But experts say there's a strong likelihood that the prison will err on the side of safety. Peterson was kept in segregation at the Will County Adult Detention Center in Joliet, Ill., for the duration of his trial due to the high-profile nature of the case and will continue to stay there until his sentencing. Former Bolingbrook, Ill., police sergeant Drew Peterson arrives at the Will County Courthouse in Joliet, Ill., for his arraignment on May 8, 2009. Jeff Shannon, a police officer and psychotherapist in the San Francisco Bay Area, said prison can cause great mental strain for former officers. “When a person who has a super strong identity as a police officer goes from a position in society that he is very proud of and that he earned to all of the sudden being in handcuffs in the back of a police car and in jail, it becomes a psychological crisis,” Shannon said. Shannon, however, believes Peterson’s brash public demeanor might actually help him in prison. Additionally, Shannon says, as a seasoned police officer, there’s no denying Peterson’s awareness and understanding of the prison system. Peterson began working with the Bolingbrook, Ill., Police Department in 1977. He served on the Metropolitan Area Narcotics Squad, and he was named “Police Officer of the Year” in 1979 by the department. Peterson was fired in 1985 from the Bolingbrook Police Department after a board of police and fire commissioners found him guilty of disobedience, conducting a self-assigned investigation, failure to report a bribe immediately, and official misconduct. Indictments alleged he solicited drugs in exchange for information. The charges were later dropped and he won reinstatement with the department in 1986. The murder trial for Peterson began years after Savio, 40, was found dead in her dry bathtub on March 1, 2004. Her death was initially ruled an accidental drowning, but investigators reclassified it as a homicide after Peterson's 23-year-old wife, Stacy Peterson, went missing. Peterson was indicted on May 7, 2009 by the Will county Grand Jury and arrested for the murder of Savio. Stacy Peterson has not yet been found. If he winds up being charged with a crime in Stacy's disappearance, Peterson could face even more time behind bars. "Wherever he’s going, police would have been there before," Pederson said. "It’s not that unique of a situation. But he’s got to start eating some humble pie." NBC News’ Kari Huus contributed to this report.